Football season is in full swing. And whether you’re a diehard fan or not, we can all agree that game day grub is a glorious thing bestowed on us. 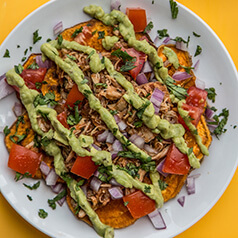 But move on over buffalo chicken dip, I’ve got one of my favorite I-can’t-believe-this-is-good-for-you recipes up my game day sleeve – loaded sweet potato nachos. The first time I did the Whole30, I knew I had to keep things interesting to survive thirty days without dairy, grain, sugar, legumes, and alcohol. For me, food boredom results in failure, most of the time. Can you relate? Because of that, I experimented with ways to feel like I was indulging, albeit with healthier indulgences. One of those touchdowns were these nachos – I even made them for Super Bowl last year, and they were loved and enjoyed by the most skeptic of eaters who run at any mention of healthy. I know what you’re thinking, “what’s the point of nachos without the cheese?” Just trust me here. These proved me wrong – and they will you, too. The slow-cooked pulled chicken and avocado drizzle will leave you scratching your head wondering what you forgot because you won’t even be missing the cheese. And thanks to the good old slow cooker and your favorite jar of salsa, they’re pretty easy to make, too. Place chicken thighs in a slow cooker, top with the salsa and spices (the amount of each spice is up to you and your taste buds). Cook on low until chicken is almost done. Remove chicken and shred, then put back in slow cooker to cook a bit more, allowing the chicken to absorb the flavors. Your house will smell amazing in the process. Thinly slice one or two sweet potatoes, or as many chips as you want to make. These make for great snacking, so you’ll likely want to make more than you need. For slicing, I use my Kitchen Aid mixer attachment that slices things perfectly (and quick!). But a mandolin or hand slicing will work fine as long as you can slice the potatoes thin so they crisp while cooking. Toss the potato slices in melted coconut oil to coat and sprinkle with sea salt. Bake at 375 on a parchment-lined baking sheet for about 10-15 minutes. Flip the chips and bake for another 10-15 under a watchful eye to not burn. Continue to cook until they are light brown or no longer mushy. Cool on a drying rack to guarantee a crispier chip. Blend with an emulsion blender (or blending device of choice). Top the cooled chips with the pulled chicken. Add chopped tomato, red onion, and whatever else your little heart desires. Top with the avocado lime drizzle and a bit of cilantro for garnish. Serve the nachos immediately, so they don’t get soggy – but don’t worry, they won’t last long. Tip: If you’re making these for game day, you can prep everything ahead of time and allow guests to load up the nachos with their toppings of choice.